Ordered Pin Oaks (2-3') in April 2018. Planted a couple weeks after receiving our bundle. Trees are thriving and look amazing so far. Very happy with the rates of survival on this particular oak. Pin Oak Trees are large oak trees known for their fantastic height and size. These trees also offer glossy dark green foliage that provides shade for all that is covers. Pin Oak can be known to turn into a smoky auburn red color in the fall months. This tree does not handle shade very well. This plant is perfect for supporting shade-loving plants which grow exceptionally well around the base of the tree. Pin Oak Trees can live to be 200 years old. This tree can adapt too many different soil conditions. These trees are unusual and can grow to become sixty to seventy feet tall, and also the canopies can grow to be forty to fifty feet wide. These are huge and majestic trees when grown. They love soils and even can grow in moist and well-drained soil conditions. The leave on this tree is smaller than some of the other oak trees and are also two to three inches long and slender when grown. 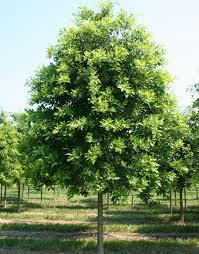 Pin Oak Trees are great and are also very easy to grow for homeowners. They provide lots of shades of color during the spring, summer and fall months of the year and also brings lots of curb appeal to a home. An oak tree is a fast-growing tree of the beech family. The pin oak tree is a red oak and one of the most common landscaping oaks, due to how easily it transplants, how swiftly it grows, and how well it tolerates pollution. It becomes well in eastern and central America, as well as southern Ontario and Australia. It likes wet soil with plenty of clay that is prone to flooding throughout the dormant season, not the growing season, however. Because it chooses this ground, the tree adapts its root system to the terrain, growing a fibrous root system instead of a taproot (which is common to most oaks). Pin Oak Tree grows best in areas where excessive amounts of water come and flooding.